There is usually no manual option; if the van loses power, the ramp won’t operate unless there is a backup system or a hand crank. An in-floor ramp is roomier as it doesn’t block the doorway – it rests in a pocket under the floor. Passengers enter and exit without having to deploy the ramp – an important consideration if you have passengers. High sidewalk curbs may prevent the in-floor ramp from deploying. When pocketed, the ramp cannot be seen from inside or outside the van, making it look more attractive. Our Dodge Grand Caravan Northstar offers an obstacle-free front row for more wheelchair maneuverability. Both front-row seats can be removed to accommodate wide power chairs and provide multiple seating options. Our Dodge Grand Caravan Northstar provides enough door height to accommodate manual wheelchairs and small-to-medium power chairs. The doorway is clear of obstructions for easy entry and exit and has a dropped floor to give wheelchair users a clear line of sight. Our Dodge Grand Caravan Northstar offers a clean, uncluttered interior. Enjoy a quiet, comfortable ride with noise-reduction engineering. Our Dodge Grand Caravan Northstar mobility minivans come with additional features for extra durability and ease of use. For example, the VMI Northstar reduces the likelihood of under-vehicle damage by providing up to 1.5 inches of additional ground clearance over other mobility vans. Our Honda Odyssey Northstar is a premium wheelchair conversion van providing industry-best flexibility, ease of use and functional aesthetics. The VMI Honda Northstar in-floor ramp conversion is a perfect blend of performance, safety and style, making it an excellent option for both manual and power chair users. Our Honda Odyssey Northstar offers an obstacle-free front row and innovative seat-base design to create more space for wheelchair rotation. Both front-row seats can be removed to accommodate wide power chairs and provide multiple seating options. Our Honda Odyssey Northstar provides the most headroom of any Honda conversion on the market. The doorway is clear of obstructions for easy entry and exit. Once inside the van, the dropped floor gives wheelchair users a clear line of sight. Our Honda Odyssey Northstar’s style, fit and finish are consistently rated best in the industry by customers and dealers. The sophisticated interior and exterior designs seamlessly integrate with Honda’s top-selling minivan. Our Honda Odyssey Northstar mobility minivans come with additional standard features for extra durability, convenience and ease of use. 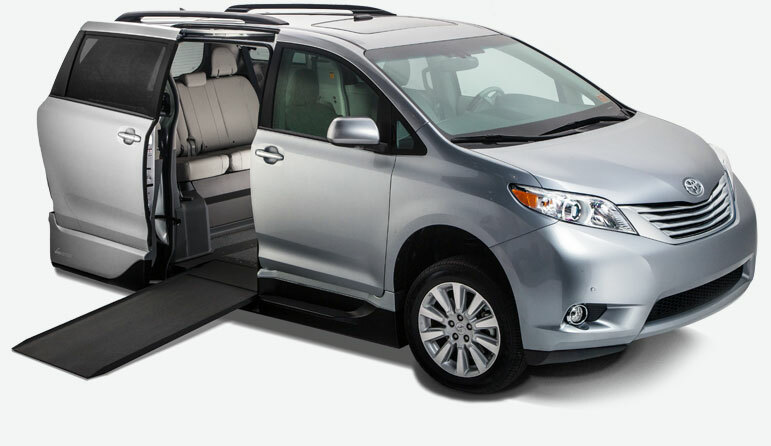 Our Toyota Sienna Northstar Access360 is the pinnacle of wheelchair conversion vans, providing unmatched flexibility, ease of use and safety. Mobility vans with VMI’s Northstar Access360 conversion offer an in-floor ramp and the most headroom and interior space in the industry for maximum wheelchair maneuverability. Our Toyota Sienna Northstar Access360 offers more interior space for a greater range of movement. With a floor 12 inches longer than any Toyota conversion on the market, the Access360 allows complete rotation for almost any wheelchair without scraping or scratching interior panels. Our Toyota Sienna Northstar Access360 offers a clean, uncluttered interior and a pleasant ride for all passengers. The VMI design seamlessly integrates the interior and exterior conversion with the factory vehicle and adds extra usability and comfort with features such as step flares and a rear-bench footrest. Our Toyota Sienna Northstar Access360 mobility minivans come with additional features for extra durability and ease of use. For example, the VMI Access360 reduces the likelihood of under-vehicle damage by providing up to 1.5 inches of additional ground clearance over other mobility vans.